SKS Science provides media and reagent bottles for the storage, examination, and mixing of samples in liquid or powder form. 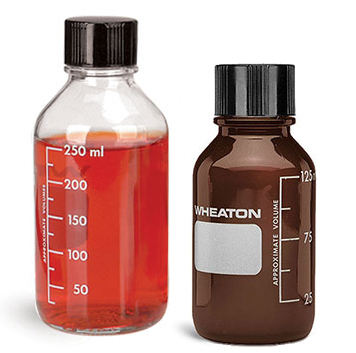 Glass media or reagent bottles are available in various styles and sizes with compatible caps to meet the needs of your specific applications. 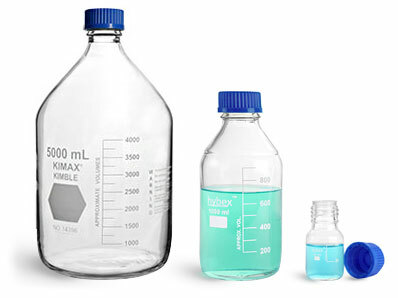 Clear glass media bottles with blue caps are available in a broad range of capacities from 100 ml to 1,000 ml and feature a KimCote® coating to extend use of the bottles while maintaining barriers to strong chemical compounds. The KimCote® coating is composed of PVC plastic, which prevents glass from shattering when dropped to avoid the leakage of potentially hazardous contents. Marking spots and graduations are painted on each bottle with a white enamel paint that is chemically resistant and scratch proof. Each size of the glass reagent bottles includes a 30 mm inner diameter opening for easy filling and pouring, natural drip free polypropylene pour rings, and compatible GL 45 screw caps. Choose between glass reagent bottles with blue caps with a KimCote® coating, without coating with blue caps, or in bulk with no coating and no caps included. A similar style of glass reagent bottles are sold in starter packs or are sold separately in a 50 ml size in cases of 10. These glass media bottles are composed of borosilicate 3.3 glass, which can be sterilized by autoclave or dry heat. Safely use these bottles within a temperature range of -70°C to 500°C. 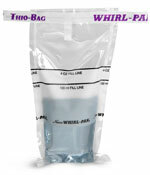 The compatible blue polypropylene unlined caps have drip-free sealing rings in the GL 45 size. Clear glass reagent bottles in 125 ml, 250 ml, 500 ml, and 1,000 ml sizes are compatible with black phenolic teflon faced rubber lined, LDPE lined and rubber lined caps. These media bottles are composed of autoclavable Wheaton "400" borosilicate glass with a low alkali content, which meets USP Type I standards to protect stored contents. A large white writing area is featured on the front of the bottles with graduation markings and features a large opening with a no-drip pour lip. Additionally, clear glass media bottles constructed of autoclavable borosilicate glass, with an added slip-resistant plastisol safety coating to reduce breakage and protect from hazardous materials, are available in 250 ml, 500 ml, and 1,000 ml sizes. The white polypropylene caps have a wedge shaped inner sealing ring and pouring ring. Graduated glass reagent bottles composed of amber glass are available in a 125 ml size. Amber glass reagent bottles include a choice of phenolic caps with a PE liner, rubber liner, or teflon liner to suit the contents within. White printed graduations in 25 ml intervals and writing area are easy to read during use. The amber tint to the borosilicate glass provides excellent protection from ultraviolet radiation. 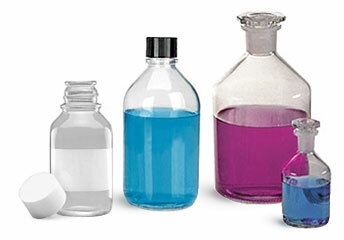 SKS Science has various styles of glass media bottles without graduation markings available for purchase. In 125 ml and 250 ml sizes, clear glass media bottles come with a white writing area and white polypropylene ribbed screw caps. The caps are pre-attached to the bottles and include teflon liners. The bottles are composed of autoclavable borosilicate glass with a plastisol coating on the outside to contain hazardous materials if dropped. Clear glass reagent bottles with no graduations or labeling are available in 125 ml, 250 ml, and 500 ml sizes with black PE lined phenolic caps. In place of plastic caps, consider purchasing clear glass reagent bottles with glass stoppers with a narrow or wide mouth. The reagent bottles and glass stoppers are composed of autoclavable borosilicate glass. Octagon-shaped ground stoppers are designed to prevent airborne contaminants from reaching the bottle contents, and fit securely into the openings with no-drip pouring lips. Wide mouth reagent bottles are available in 250 ml, 500 ml, 1,000 ml, and 2,000 ml sizes, while the narrow mouth bottles are offered in the same range of sizes with an additional 5,000 ml size. The 250ml and 500 ml size narrow mouth bottles are also available in amber glass for light-sensitive products. SKS Science offers clear plastic media bottles composed of PET and polycarbonate. These PET bottles are lightweight, provide glass-like clarity, and have high resistances and good barriers to diluted acids, oils, alcohols, moisture, and oxygen. 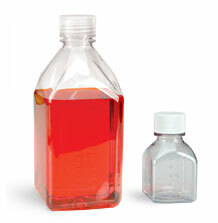 Clear PET reagent bottles are sold with red caps in 250 ml and 500 ml sizes. The bottles come ionized sterile and with molded graduations on the side. A 31.7 mm neck opening reduces the likelihood of spills when filling. Square PET media bottles in 125 ml and 1,000 ml sizes have been tested for pH stability, temperature durability, cloning efficiency, and cytotoxicity. These bottles feature molded graduations, no-drip pouring lips, and 20% headspace for additives. Each order of bottles is packaged in sterile shrink-wrapped trays. Octagonal square polycarbonate media bottles are offered in 125 ml, 250 ml, 500 ml, and 1,000 ml sizes. Polycarbonate plastic provides excellent clarity, good moisture barriers, and can withstand high levels of impact, heat, and cold. Polycarbonate is suitable to test in temperatures ranging from -40°F to 250°F.